Resting systolic (SBP) and diastolic (DBP) blood pressures (mmHg) were measured in all 5 studies, and on multiple occasions within study (see Table 1). From these data, resting pulse pressure was computed for each measurement time-point as the simple difference between systolic and diastolic blood pressure measurements (i.e., SBP-DBP); resting mean arterial pressure (MAP) was computed using the following formula: MAP = [(2 x DBP) + SBP] / 3. SBP and DBP were assessed by the study clinician during either of the 2 quarantine days preceding the day of viral challenge (day 0) using a standard mercury column sphygmomanometer. SBP and DBP were assessed on quarantine day 0 (baseline) and all 5 post-challenge days. Pressures were recorded 3 times per day (morning, afternoon, and evening) using an automated blood pressure monitor (Marshall TM94, Omron Healthcare, Vermon Hills, IL, USA). Morning BP was recorded by a study physician during participants’ daily physical exams and afternoon, and evening BPs were recorded by study staff. SBP and DBP values for each day were computed by taking the average of the 3 daily blood pressure recordings. On quarantine day 0 (baseline), SBP and DBP in the dominant arm were measured manually using a standard mercury column sphygmomanometer. Day 0 SBP and DBP values were computed as the average of 3 measurements taken with approximately 2 minutes between readings. 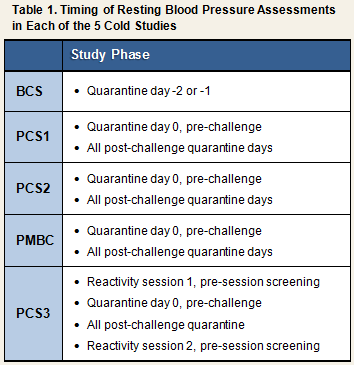 On all subsequent post-challenge quarantine days, SBP and DBP were recorded 3 times per day (morning, afternoon, and evening) using an automated blood pressure monitor. Morning BP was recorded by a study physician during participants’ daily physical exams and afternoon and evening BPs were recorded by study staff. SBP and DBP values for each post-challenge day were computed by taking the average of the 3 daily blood pressure recordings. During the two reactivity sessions, and prior to the participants’ entering the reactivity chamber, baseline resting SBP and DBP were measured by study staff trained in auscultatory techniques using a mercury column sphygmomanometer and standard adult cuff. Three measurements were taken while participants were in a sitting position, with the measurement arm resting at heart level. Resting BP was computed as the average of the last 2 readings. While in quarantine (day 0 [baseline] and all 5 post-challenge days), participants’ pressures were recorded 3 times per day (8:00 am, 1:00 pm, and 7:00 pm) using a portable automated oscillometric blood pressure monitor (Spot Vital Signs, Welch Allyn, Inc., Skaneateles Falls, NY, USA). Morning BP was recorded by a study physician during participants’ daily physical exams and afternoon and evening BPs were recorded by study staff. SBP and DBP values for each day were computed by taking the average of the 3 daily blood pressure recordings. For all 3 studies, resting heart rate (bpm) was measured on quarantine day 0 (baseline), prior to viral challenge, and on each of the subsequent post-challenge quarantine days. In PCS1 and PCS2, heart rate was measured each morning while in quarantine, simultaneously with BP, using an automated BP monitor (Omron). In PCS3, heart rate was measured 3 times per day (8:00 am, 1:00 pm, and 7:00 pm) also using an automated BP monitor (Welch Allyn), and simultaneously with BP. Resting heart rate values for each day were computed by taking the average of the 3 daily heart rate recordings. Resting measures of cardiovascular activity also can be obtained from data collected during the resting baseline component of the stress reactivity sessions. These measures include automated measurements of resting SBP, DBP, MAP, and heart rate, as well as measurements of resting heart rate variability (HRV) obtained from EKG data.